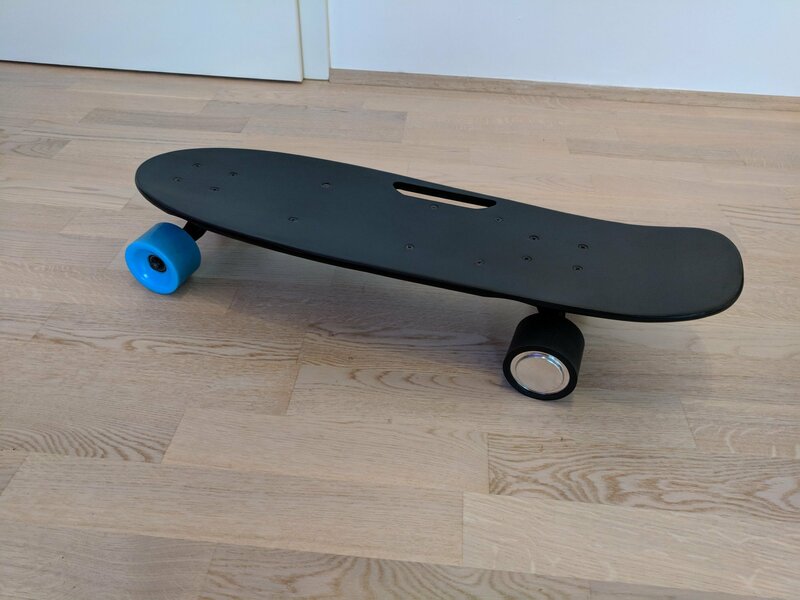 The board was shipped by Amazon including Prime - perfect for me: No need to wait weeks to get the board from China or have the risk that the board is lost on its travel to Germany. 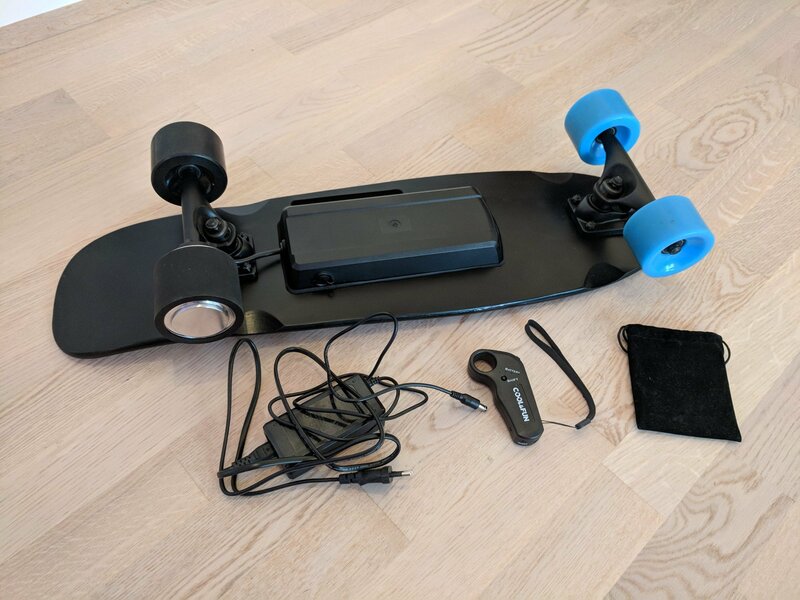 I bought the board to look how commercial manufacturers solve problems i had when i designed/built my new board generation - for example battery balancing, speed control, heat management... And to spoiler a bit: For 200€ you don't get a lot of high tech, but i expected a lot more worse design: The quality is not that bad for that price! The battery consists of 7 lithium-ion cells of the common 18650 type. The cells are connected in series which results in a voltage of around 25,5V. According to the label of the battery the manufacturer of the pack is Elite Electronic Co., Ltd.. 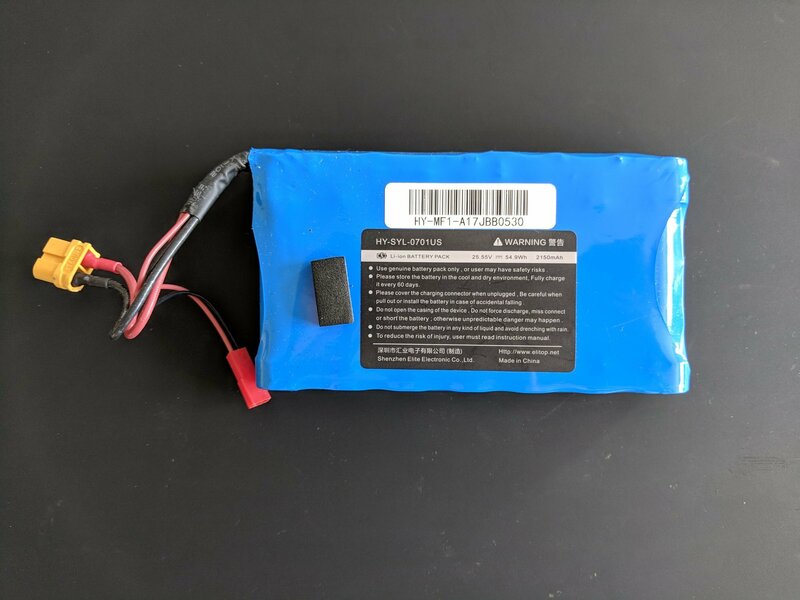 The capacity is labeled to around 55Wh or 2150mAh. 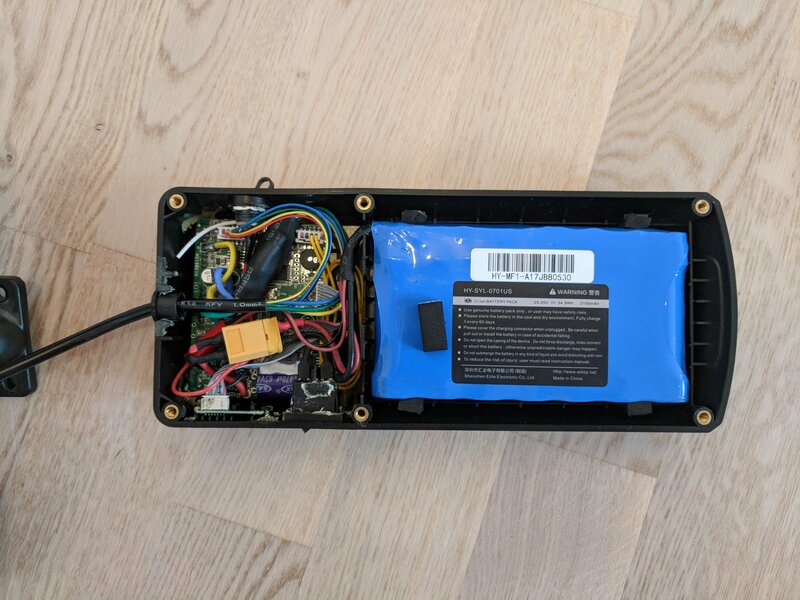 I was not able to measure the real capacity because my charger is only able to charge/discharge battery packs with a maximum of 6 cells in series. But i guess the real capacity is lower than the spec promises (like always for Chinese products). 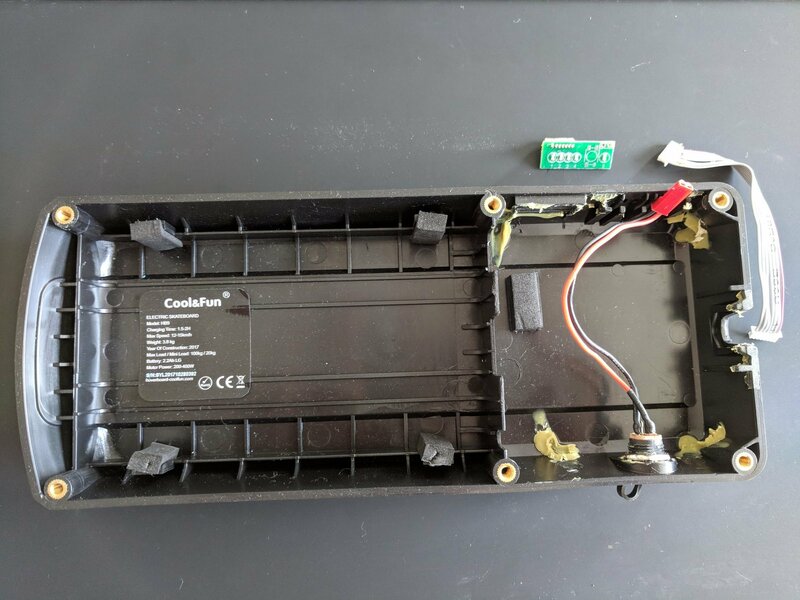 The outer label says the battery manufacturer is LG which may be correct because Elite Electronic Co., Ltd. potentially just assembled the battery pack, but not the cells itself. 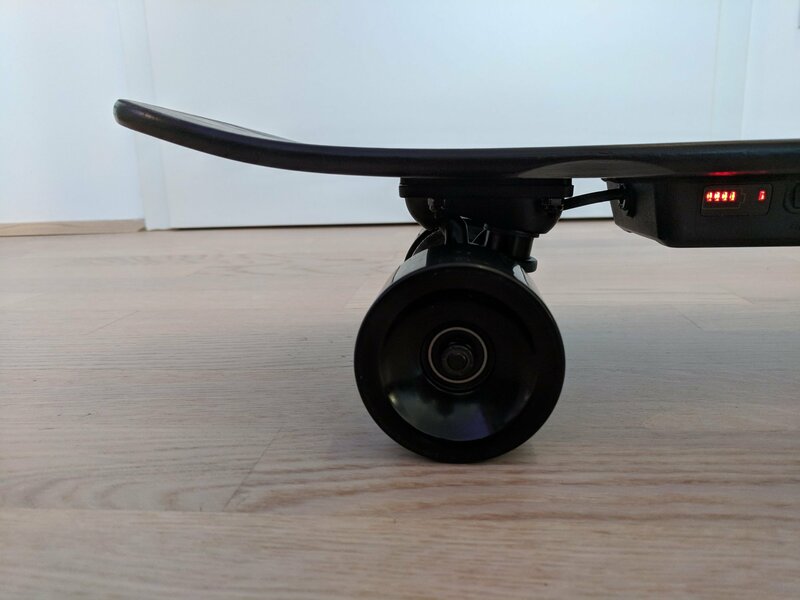 The board uses the micro remote control which model type is really typical for electric boards. For the wireless communication a NRF24L01 is used (strange to say with an on-circuit antenna and also an external antenna). The microcontroller on the remote circuit is labeled SPMC65SF112A HL213 which may be a custom IC or a re-labeled microcontroller with custom firmware. I'm not really sure because i didn't found any datasheet for this chip. 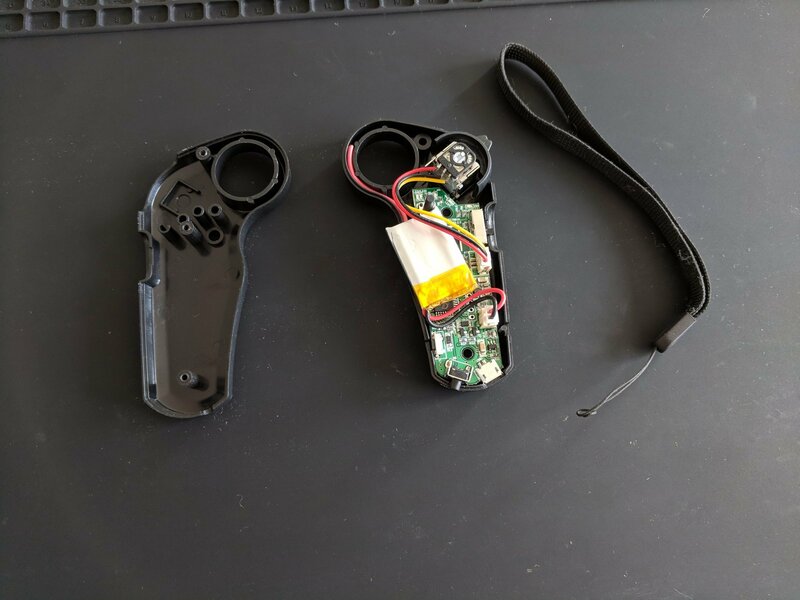 The remote has one green power LED and three red LEDs to indicate the battery level of the remote. The power switch is on the bottom side of the device, the push button on the top toggles the reverse gear. 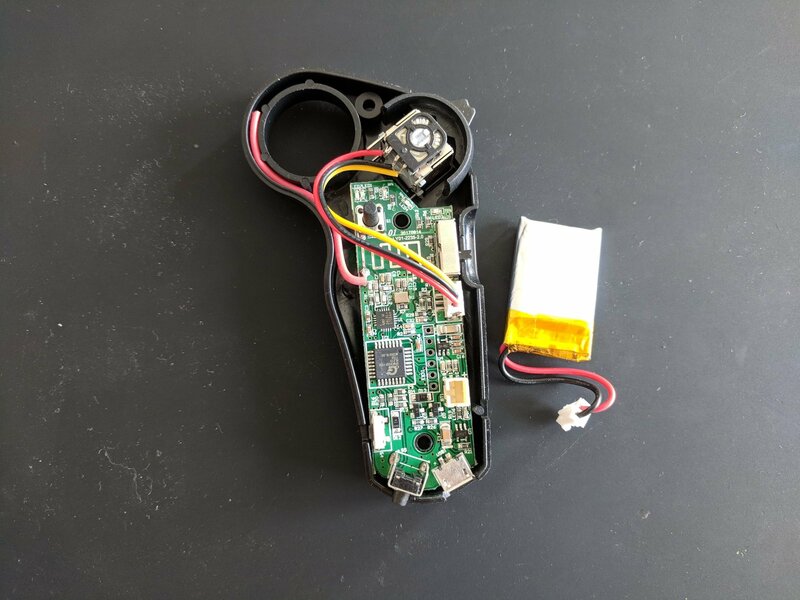 The small push button seems to reset/repair the connection to the board. The acceleration/braking is controlled via a reasonable slide switch. The power of the motor can be limited with a three position switch (low/normal/high). The remote is powered from a small lithium-polymer cell with 200mAh capacity. 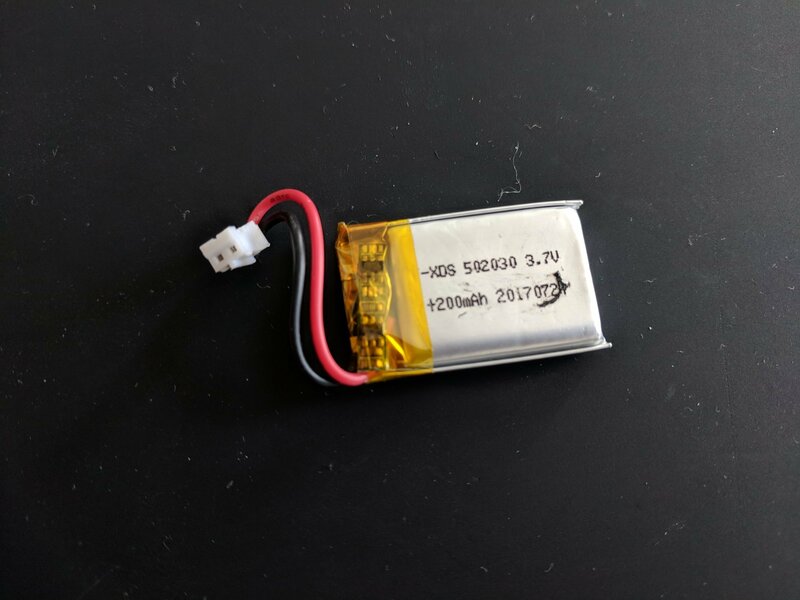 The battery is labeled with XDS 502030 and seems to be manufactured end of July in 2017. 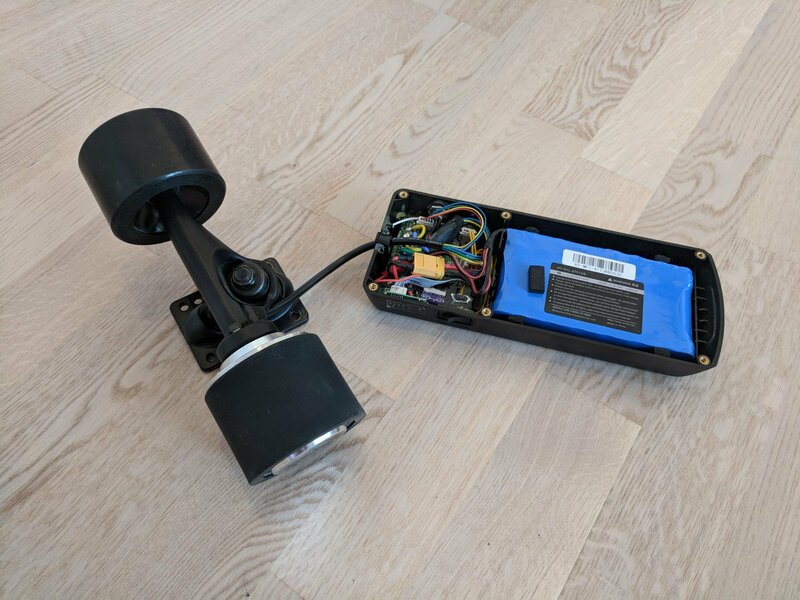 The board uses a single hub motor with a power of 200 to 400W. The motor has a good torque and the start is really smooth. 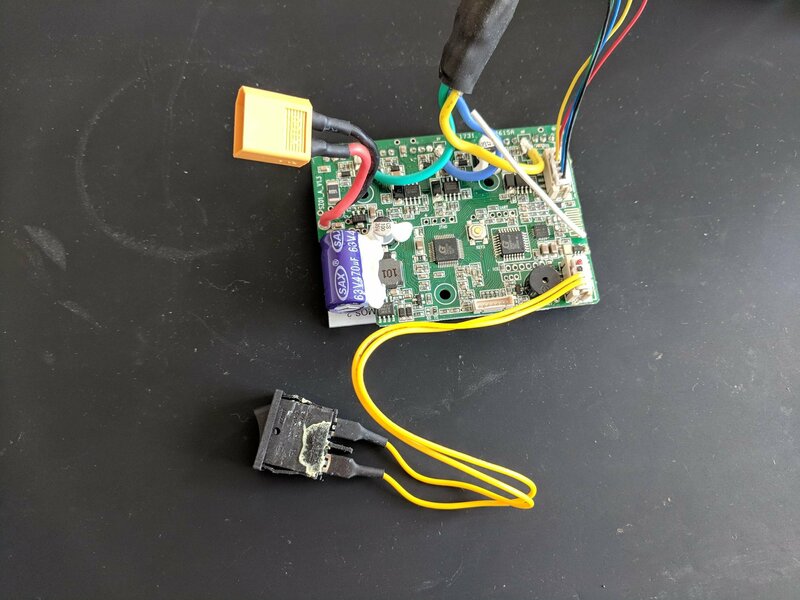 But the motor control software in general is not really a highlight of the board: The commands of the remote control seems a bit delayed and the motor does not react immediately to the user input. This is not a big issue when riding, the board is easy to control nevertheless. But the most annoying and also dangerous problem is the brake: If you want to slow down from high speeds (around 15-20 km/h), the motor brake reacts really aggressive and possibly kicks you off the board if you are not experienced or prepared for that. Despite you brake very sensitive, it takes some time to deal with the brakes. 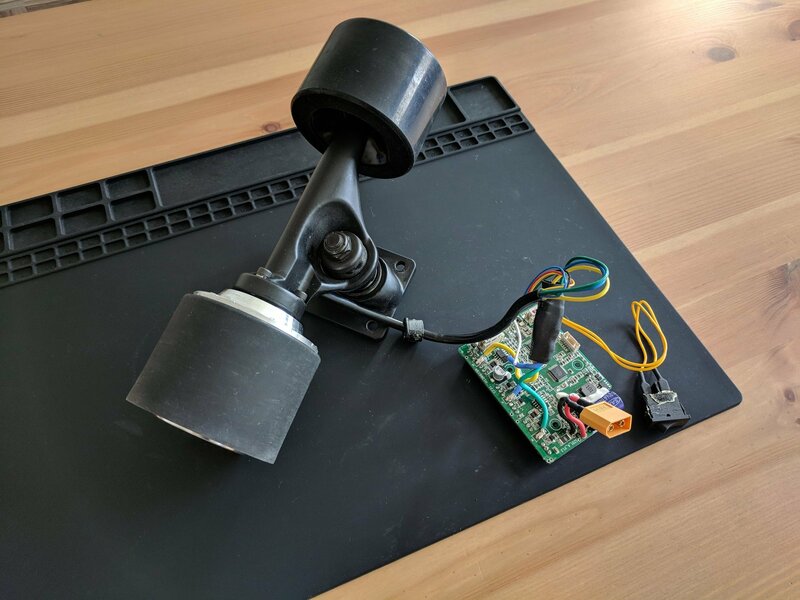 If you want to switch your board on, you have to options: Either you turn it on via pushing the single-position switch or you simply push the board on the ground (the generated power is detected by the motor controller which turns on the board). The battery status of the board is indicated by 4 red LEDs. The main board looks well soldered. It consists mostly of SMD and some THT parts (the MOSFETs). 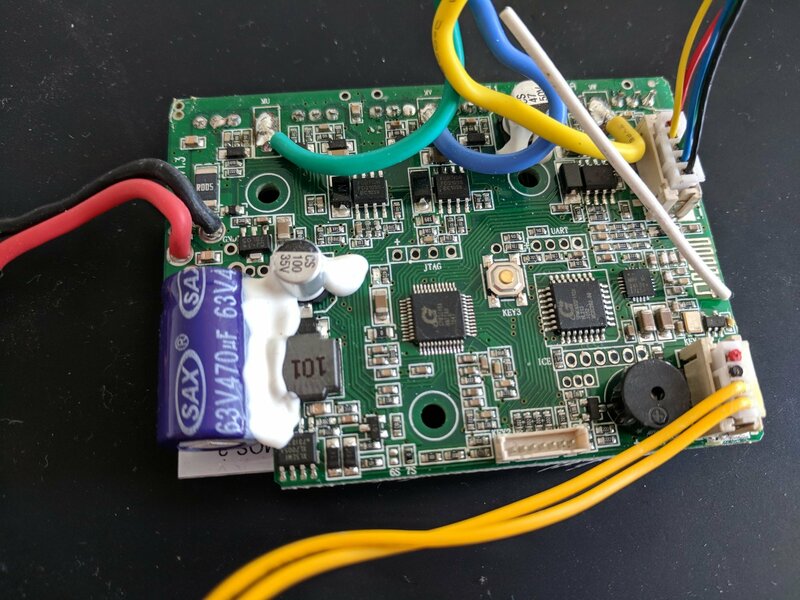 Multiple ICs can be found on the board: Firstly the same labeled IC SPMC65SF112A HL213 also with a connected NRF24L01 on the board like on the remote control circuit. 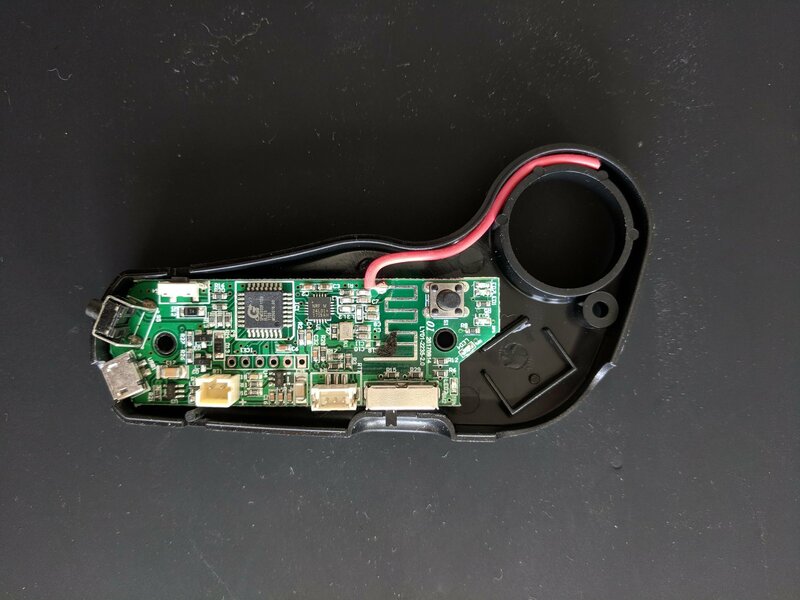 Some traces of are connected to the battery level circuit board. The chip has also some traces going to unpopulated headers which may be for flashing / debugging the IC. So it may be the main processor of the board. The second big IC is labeled SPM3248A: I neither found a datasheet for it unfortunately. It has one unpopulated pin header for UART and one for JTAG. I'm not sure what the exact purpose of these chips is. 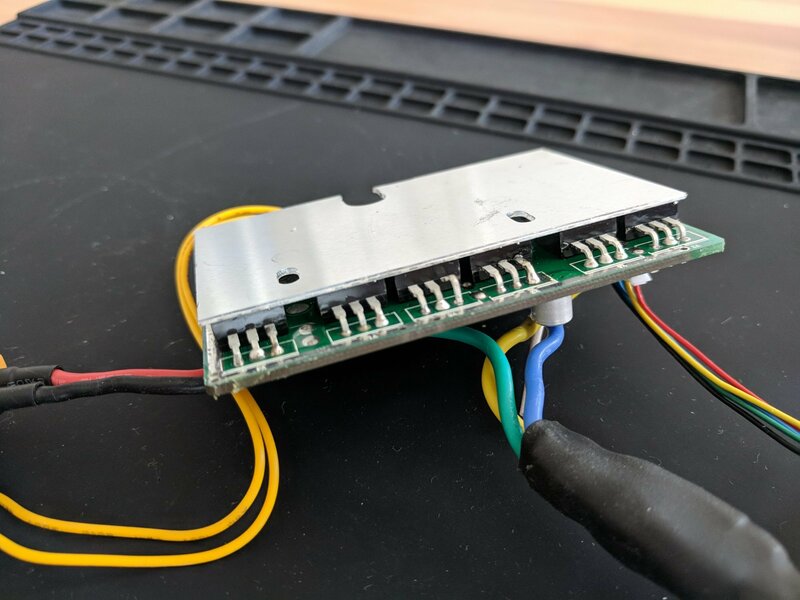 The board has 6 power MOSFETs (two for each motor phase) - these are connected to an aluminum plate used as a heat spreader. Two MOSFETs for each phase are driven by a FD2103S MOSFET driver IC from Fortior Tech. The MOSFETs itself seems to be protected with a zener diode. 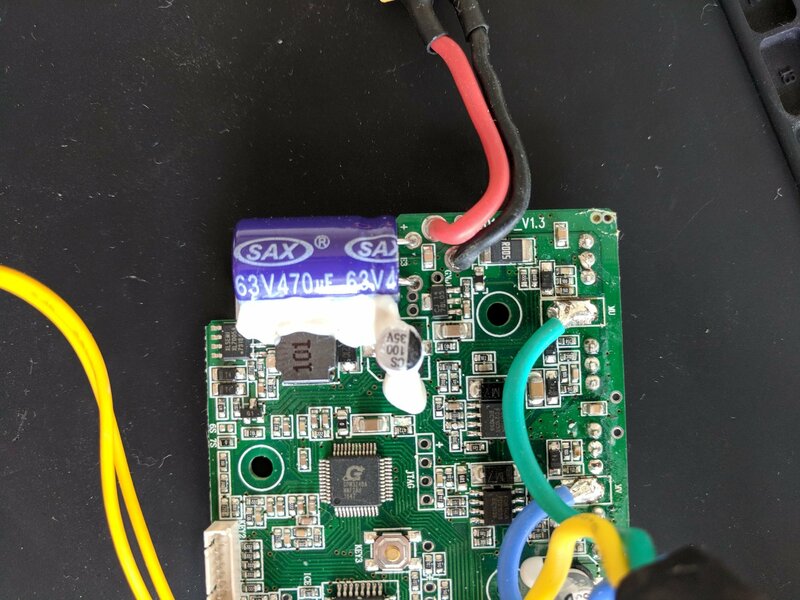 On the battery input is a big electrolytic capacitor from SAX rated with 63V and 470µF. Also a power inductor with apparently 10µH is near to the input. A shunt resistor measures the current of the system. One last IC is the XL7005A from XLSEMI - it is a low drop DC-DC buck converter with 0,4A maximum. It may used to power the ICs and other components with 5V or 3,3V. The big battery and motor phase wires are directly soldered to the board which is not perfect but the solderings look not bad at all. The motor hall sensor wires are connected to the board with a proper connector. 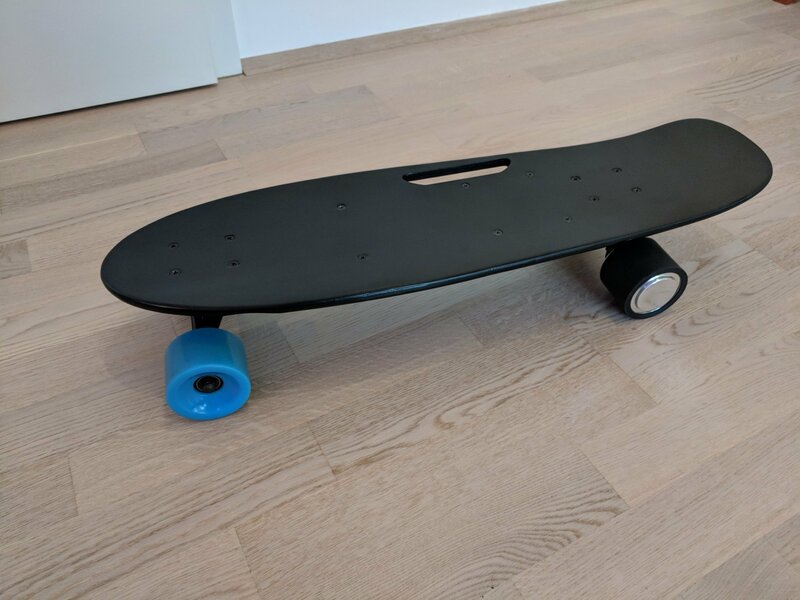 To sum up, for 200€ you get a reasonable board with some minor disadvantages: The battery capacity is small and the top speed goes down relatively fast with the battery level. 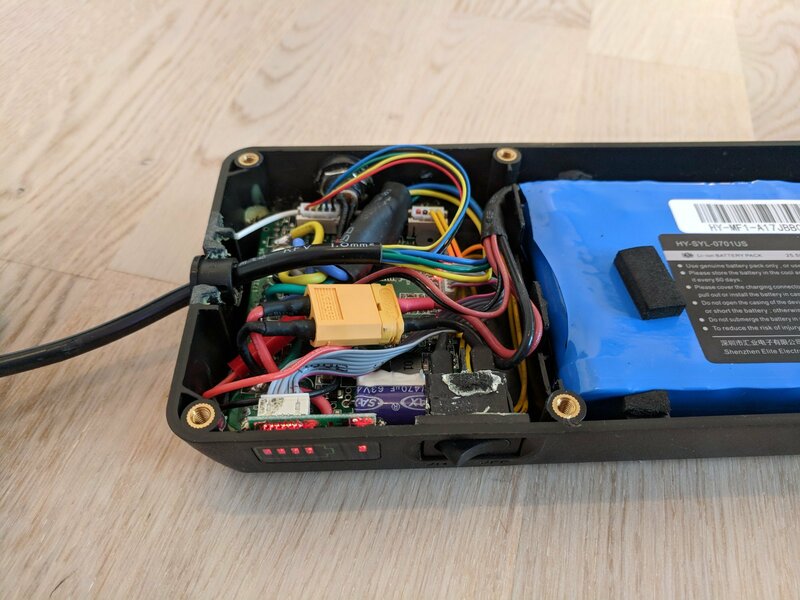 I missed a proper BMS for a long battery lifetime and also fuses to protect the board: The battery stores a lot of chemical energy which could cause a fire or an explosion if a fatal malfunction occurs in the system (e.g. short circuit). Finally the top speed of around 15 km/h (high setting) is okay but could be higher in my mind. The lower speed settings are only useful for childs or to learn to ride the board - but in all other cases they are to a lot too slow.